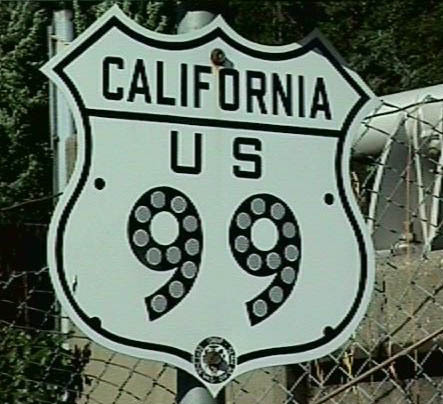 Several Historic U.S. 99 cutout shields were posted along the Dunsmuir business loop for Interstate 5 in 1999, but no longer in place by 2005. Some of these signs were replicas of vintage shields, while others were reused original signs. Photo taken by Jerry Mullady (03/99). Signed as both Historic U.S. 99 and Business Loop I-5, the 3.3 mile route at the city of Dunsmuir intertwines with I-5 between Exits 729 and 732.
Business Loop I-5 separates from I-5 at a trumpet interchange. The freeway straddles the eastern slopes of Mount Bradley while Historic U.S. 99 (Dunsmuir Avenue) leads north between the freeway and a parallel Union Pacific Railroad line. Photo taken 05/25/08. Continuing north, the first Business Loop I-5 north reassurance shield stands after the intersection with Oak Street. Photo taken 05/25/08. This view looks north along Business Loop I-5 and Historic U.S. 99 (Dunsmuir Avenue) in Downtown Dunsmuir near city hall and Cedar Street. Photo taken 05/25/08. Dunsmuir Avenue turns at Spruce Street, matching the course of the adjacent Sacramento River. Photo taken 05/25/08. The historic California Theater is located at the northwest corner of Dunsmuir Avenue and Pine Street in Downtown Dunsmuir. Photo taken 05/25/08. A reassurance marker for Business Loop I-5 stands along Dunsmuir Avenue north of Willow Street. The shield includes the redundant letter I. Photo taken 05/25/08. Business Loop I-5 (Dunsmuir Avenue) switches sides with Interstate 5 between Florence Loop and the Sacramento River. Photo taken 05/25/08. An elongated parclo interchange connects Interstate 5 and Historic U.S. 99 (Dunsmuir Avenue) at Exit 730. Photo taken 05/25/08. A reassurance marker for Business Loop I-5 follows as Dunsmuir Avenue curves northwest below the freeway. Photo taken 05/25/08. A trailblazer for Historic U.S. 99 references Dunsmuir Avenue north and south from the northbound freeway off-ramp. A Business Loop I-5 shield was also posted here in 1999. Photo taken 05/25/08. A short ramp curves onto adjacent Interstate 5 leading south toward Redding and Sacramento from Dunsmuir Avenue. Photo taken 05/25/08. The Sacramento River bridge along Business Loop I-5 (Historic U.S. 99) appears in the Caltrans District II Bridge Log as Bridge Number 02-0002Y, Sacramento River Bridge Overhead, built in 1966. Photo taken 05/25/08. The concrete arch bridge carrying parallel I-5 across the Sacramento River was built for U.S. 99 in 1955. The Caltrans District II Bridge Log lists this as Bridge Number 02-0002, Sacramento River Bridge Overhead. The span was expanded to its current size in 1983. Photo taken 05/25/08. Nearing the end of the Sacramento River bridge, Dunsmuir Avenue passes over Upper Soda Road ahead of the I-5 southbound off-ramp. Photo taken 05/25/08. Business Loop I-5 passes under an overpass that carries Siskiyou Avenue across both Dunsmuir Avenue and mainline Interstate 5. Sisikyou Avenue runs along the east side of I-5 to Exit 732. Photo taken 05/25/08. Dunsmuir City Park and Botanical Gardens lines the west side of Business Loop I-5 north of Siskiyou Avenue and west to the Sacramento River. Photo taken 05/25/08. As Business Loop I-5 ends, Dunsmuir Avenue and Historic U.S. 99 split to the north, lining the west side frontage road of Interstate 5 to Shasta Springs. Photo taken 05/25/08. A Business Loop I-5 shield was previously posted south of the Sacramento River along Dunsmuir Avenue. Photo taken February 1999. February 1999 by Jim Maffrand. 05/25/08 by AARoads.